Give your decor a unique rustic look with this solid wood chair. It features an interesting silhouette with angled back legs and a curved back. Plus, its seat is upholstered with leather, so you know sitting here will always be comfortable. The Salamanca Rustic Solid Wood Chair with Bonded Leather Seat by International Furniture Direct at Zak's Home in the Tri-Cities, Johnson City, Tennessee area. Product availability may vary. Contact us for the most current availability on this product. With their solid wood construction and design accents, this whole home collection is sure to warm up your home with its rustic charm. Thanks to their unique designs, these pieces are sure to give you the perfect gathering place. 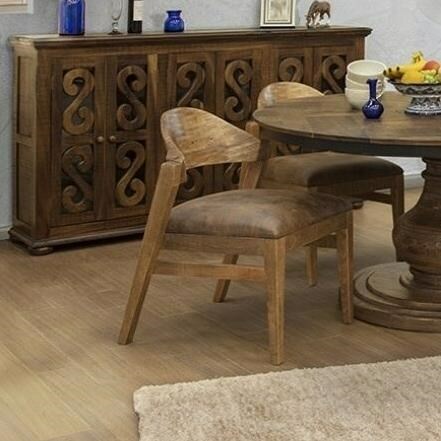 The Salamanca collection is a great option if you are looking for Rustic Transitional furniture in the Tri-Cities, Johnson City, Tennessee area.